When Claire’s husband is killed, she and her estranged sister Lydia face their past and unearth the secrets that destroyed their family more than twenty years ago. 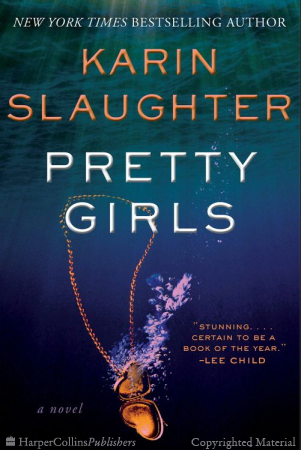 Slaughter guides Pretty Girls into an in-depth look at a family forever defined by its tragedy. Each time a young woman is reported missing, Julia’s survivors feel as if their own emotional wounds have been reopened. As Claire delves into Paul’s background, she begins to realize how little she knew him … Slaughter keeps the tension high as Pretty Girls alternatively follows Lydia and Claire and the letters their father wrote to Julia, documenting his endless search for his missing child and pinpointing when savagery entered their lives. Slaughter’s unflinching descriptions of violence are never gratuitous but are not for the faint of heart. A hell-raising thriller … Slaughter executes a number of tricky plot twists, some clever and others preposterous. (Would the F.B.I. really offer witness protection to someone who’s a ‘borderline psychopath’?) But all these sweaty maneuvers are in the service of a genuinely exciting narrative driven by strong-willed female characters who can’t wait around until the boys shake the lead out of their shoes. In order to realistically tell this story Slaughter focuses an unflinching eye on the occurrences, and where other writers would see a stop sign, Slaughter forges boldly ahead. Some may say her descriptions are too graphic but I applaud her for making these scenes real. You can not be a passive observer and read this book. You are brought into all the full revelations ... There is so much passion, poignancy, humor and horror that the pages overflow. This is not a short novel but even with its length the reader finds it ends much too quickly. You have grown to know these people and you want to know more … Pretty Girls is one of the year’s most fascinating stories, told with the creatively inventive touch of a true master of suspense. What did you think of Pretty Girls?